The other day, my friend was telling me about a new bug bite she had gotten. In particular, she was asking me what kind of bug would leave a bump about 3/4 cm in diameter that is red or flesh colored, AND ALSO leave the surrounding area bruised. Well, I don’t really know. I suppose any bug that has a lot of anti-coagulants in their saliva. Now, you might wonder why a bug would need anti-coagulants in their saliva. Obviously, it’s so that they don’t have to waste energy making 291837923 different holes in you to get enough to eat. Also, it’s so they don’t choke on a blood clot while they’re trying to get a meal. Have you ever wondered what that might look like? Here, I drew you a picture. 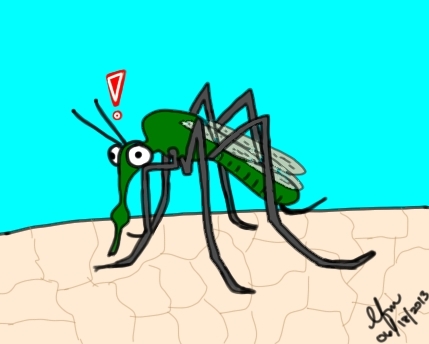 I’m pretty sure a mosquito would look something like that when she realized that she sucked up a largish blood clot because she didn’t inject enough saliva into you to prevent you from making blood clots. Now she’s going to choke and die. Anyway, what I assume happened was that whatever bug ended up biting my friend and leaving that mark injected a little too much saliva into the bite. So, when the bug was finished eating, my friend wasn’t able to clot and continued to bleed a little, subcutaneously. That’s what caused the bruise. The bump was caused by the body’s natural reaction to the bite itself and the saliva the bug left behind. It really could have been any blood sucking blood. It could have even had been a leech, but that’s pretty unlikely seeing as how she wasn’t in leech-infested waters at the time of the bite and a leech bite normally bleeds for quite awhile afterward and my friend probably would have noticed that. Last week, I posted about the zombee apocalypse. One J.R. McHackingstuff pointed out that I neglected to provide any illustrations of zombees. Unforunately, that was true. I was completely remiss in my duties to provide something so ridiculous as an illustration of a zombee. So I got to work on that. 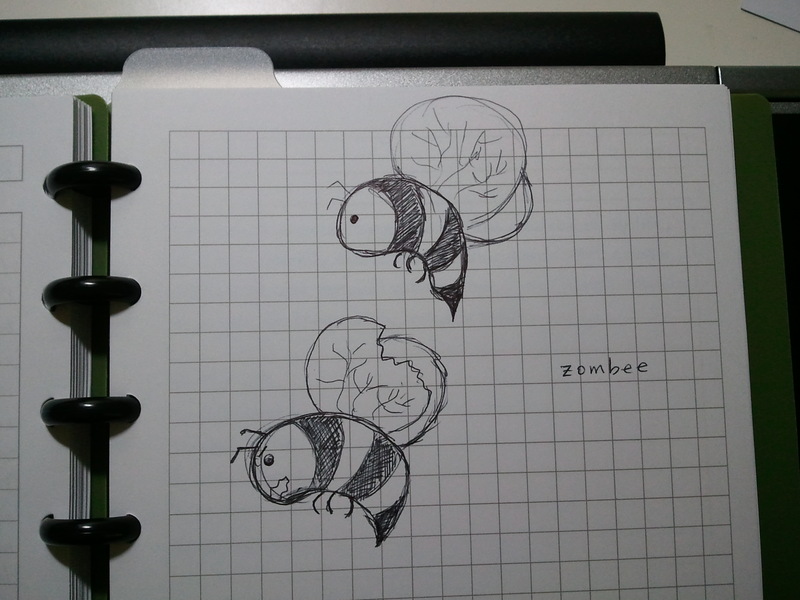 The problem is…I don’t really know how to draw a zombee. If you take a look at my drawings of bees, they already push the boundaries of looking like bees. I mean, three legs? Such short antennae? Really? So, I present you my best effort on a zombee. It…unfortunately, probably does not look much like a zombee. I am saddened. Incidentally, I found some more random bees in my yard at night that looked like they were in the process of keeling over. I didn’t collect them for observation though. I really should get on that.